(TORONTO, ON) ─ At a media conference held at Queen’s Park today, representatives of 90 community and labour groups unveiled a province-wide campaign, called “We Are Ontario,” to challenge lopsided budget priorities that promise more hardship for families while protecting the profits for big corporations. McGuinty’s cuts to jobs and services, which are the largest since Mike Harris’ first term of office, have stirred an opposition to match. The campaign is expected to draw 97 busloads and thousands of people to a rally against McGuinty’s budget cuts at Queen’s Park at 3:00 pm on Saturday, April 21. A mass community assembly will kick-off the campaign from 3:00 to 6:00 pm on Friday, April 20 at the Church of the Holy Trinity (behind Toronto’s Eaton Centre). “Without new funding for child care, centres are going to close and Ontario families are going to lose spaces. It will mean the difference for some parents between staying in the workforce and falling through the cracks,” said Andrea Calver from the Ontario Coalition for Better Child Care. 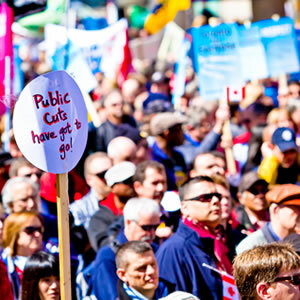 “We Are Ontario” represents millions of Ontarians represented by nearly 100 community groups and labour unions.